The Scotland players were let down by organisational failures on their recent journey home from Georgia, claims former Scotland winger Pat Nevin. Nevin told BBC Scotland's Sportsound that the Scottish Football Association did not provide comfortable seats on the overnight flight back from Tbilisi. He said there was only burger and chips for the players to eat at the airport. "The SFA has not done this well on this occasion," said Nevin. "Something has to be done. That cannot happen again." 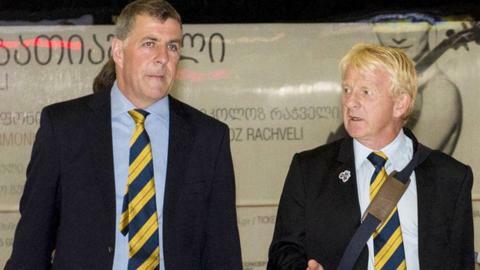 The squad's return flight, after Scotland's 1-0 defeat by Georgia in Euro 2016 qualifying, was delayed by two and a half hours. The team arrived back in Glasgow about 06:00 BST on Saturday, with a match against world champions Germany to follow on Monday evening. Nevin complimented the "ultra pleasant" SFA for doing "a lot of things really well on this trip". However, he criticised them for failing to act on his suggestion to an official on the outward flight that something ought to be done to give the players more leg room then and on the return trip. Speaking on BBC Radio 5 live before Scotland's 3-2 defeat by Germany at Hampden, Nevin said: "The seats on that plane were uncomfortable for me. I'm 5ft 6.5in. Imagine how they must have felt for the players, who are travelling overnight. "It was a six-hour flight with a three-hour delay, 4,000km over three time zones, in those cramped seats. "After the game, we had two or three hours milling about in the airport afterwards with the fans, with the journalists. "The players lined up in front of Burger King where they ate burger and chips. "They had to refuel but there was no other food that they could have. "What about all these sports scientists? I was really, really disappointed with the organisation." The SFA declined to comment on the points he had raised. On Wednesday's Sportsound, Nevin revealed he had spoken to some of the players "who were really disappointed with it" but who "are not going to say anything because it's after the game and they have been beaten". "They are a great bunch of guys; they are not going to complain about everything," said the former Chelsea and Everton winger. "The plane was a (Boeing) 737-800, I believe, which is not the standard of plane the players would expect to be going on a long-haul journey - it's a six-hour flight - and particularly a journey back overnight. "What you have to do is bite the bullet and get the best plane available and make sure the players can get a bit of kip and lie back. "There isn't a team on this planet that thinks it's a really good idea to go without sleep two nights before playing the world champions. "All I want is for it to be better for the players to give them the best chance." Nevin said on the outward journey there were 18 seats free that afforded better leg room than the players had in the seats they were allocated. He himself had a "good" seat and this prompted him to speak to the SFA official. "There was the opportunity to adapt it and it wasn't taken," said Nevin. And on the subject of nutrition, he said: "Have a read back at anything Gordon Strachan has ever said about eating and refuelling and then think about burger and chips and try to get your head round it."